Investing in beautiful landscaping and pathway elements can be essential for your home or business. All across the country, residences, college campuses, hospitals, and more all rely on beautiful outdoor designs to to provide aesthetic beauty in addition to other healthful benefits. In many cases, a material binder is needed to prevent early degradation and water runoff problems. Howell Pathways, upon joining with Klingstone Paths, is proud to offer our patented polyurethane sealant, providing comprehensive quality every square inch of the way. Our company proudly served all of the industries above, from Miami International Airport to Colonial Williamsburg, Texas A&M, and more. Our quality material binding agent is made to deliver full protection for a wide range of needs, including ADA-pathway requirements, DIY garden paths, and more. Our affordable gravel stabilizer works to increase material cohesion, providing a stable surface that is able to resist the harmful effects of heavy rainfall. This may prove helpful for those in need of a solution to keep their garden walkways intact. Today, we’ll conclude our tips that may prove helpful in keeping your landscape intact. 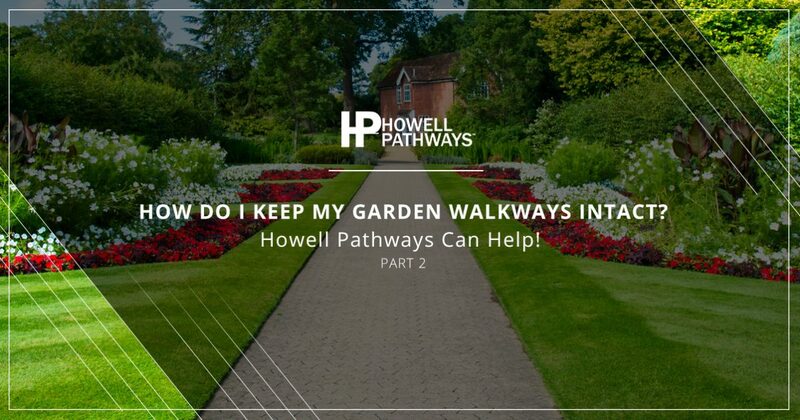 If you’re ready for a top-notch solution, be sure to reach out to Howell Pathways today! As our last blog post pointed out, water runoff can prove to be very damaging to your landscaping, paths, and building foundation. One beneficial project is the process of ensuring that all sides of your property are addressed. Many homeowners focus on the front of their place, making a solid first impression for guests while also increasing their curb appeal. Unfortunately, this leaves the sides and back yard open to soil and erosion problems. Implementing a comprehensive landscape design for your home or business may prove to be the perfect answer for addressing variable drainage problems. One way to change the volume and flow of H2O on your property is to manually change the landscape yourself. Garden pathways can benefit from selective draining measures, including channels, changing the grade, and introducing natural elements such as stones. If you have a tide of water wash over your landscape after every rainfall, then now may be the time to invest in a drainage swale. These ditches constitute a simple, effective method that utilizes gravity to disperse much of your rainwater. You can place landscaping elements in addition to this swale for added dispersal and aesthetic beauty. In many cases, burying a perforated pipe beneath your garden elements will help to provide an open channel for excess moisture, often retaining it until needed later. Landscape materials such as decorative stones are ideal for providing strong diversions for water runoff, but can also prove to be costly. Our landscape experts can assist you in finding the perfect combination of stones and bricks to meet your budget. Oftentimes, this can include laying larger stones for the base while using more costly elements as the finish layer. Our gravel stabilizer supports aggregates and other natural materials at least ⅛-inch or larger, delivering added support and protection to keep your physical water dispersal in place. Invest in Our Pathway Stabilizer! As you may have predicted, Howell Pathways, with Klingstone Paths, has produced this blog post to promote our pathway stabilizer for those in need in Texas, California, Florida, and almost everywhere in between. Our polyurethane sealant is beautiful, durable, and eco-friendly. Not only is it affordable and long-lasting, but it is also easy to apply. Klingstone Paths is your source for landscape binding materials, providing comprehensive services to get the job done right. Contact us today to learn more and to receive a quote for our Top Rated National® pathway stabilizer!